Category editor. This is a GUI tool that allows you to move categories of parts to different positions in the hierarchy. It can also hide them altogether. Add, edit or remove individual items. There is no GUI to support this, but can be done by editing a catalog file. The hierarchical structure of the part selector may be changed using the category editor. All parts listed in the part selector are assigned category names. The category editor maps these category names to positions in the part selector hierarchy. For example, the category name NMOS maps to the location Discretes ???MATH???\rightarrow???MATH??? MOSFETs - N-channel. So by using the category editor, it is possible to reorganise how parts are displayed. You can also remove categories from the part selector by moving them to the path called ** HIDDEN **. 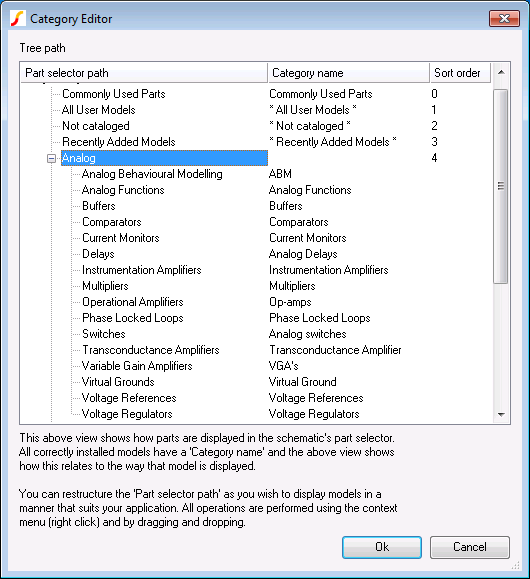 On the left hand side is a list of part selector paths. These are not individual parts but folders within the part selector that contain parts. On the right hand side are the category names. All parts displayed in the category editor have a category name. Rename folder entries in the part selector. Select the entry then right click menu Rename. Hide categories of parts that you don't use. Select the category you do not wish to show in the part selector. Drag and drop to the ** HIDDEN ** category path. Change order of categories. Select a category or category folder then right click menu Edit Sort Order. Enter a positive number - the small the number, the earlier in the list the item will be placed. Items without a defined sort order will be placed below items with a sort order. Items with the same sort order will be sorted alphabetically. Delete Categories and category folders. Note: you cannot delete categories and category folders that are built-in; you can only delete new categories or folders that you have created. If you want to remove items from the part selector, you can move the category to the ** HIDDEN ** folder. See item 2 above. It is also possible to add your own parts to the part selector although there is no GUI available to do this. Each line of this file defines a single entry in the part selector. The line is a semi-colon delimited list of fields that define various aspects of the part. See the following table for a definition of each of these fields. You can create as many lines like the above as you wish, but it is important that each occupies a single line in the file. nnn is the SIMetrix version as an integer, e.g. 800 for version 8.